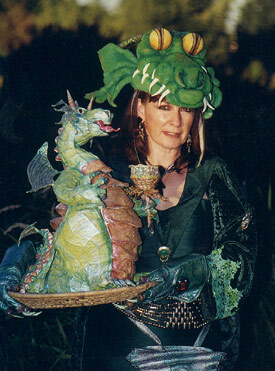 Hello everyone – my title is “The Dragonqueen”. I’m a dreamer, a painter and writer of Dragon Tales & other whimsical things. Speaking on their behalf - most Dragons have been misrepresented, by being portrayed as heavy meat eaters with nasty tempers! That is a fable! In my world they are vegetarians and colourful friendly individuals. They are respected for their courage, strength, and abilities to help us. They are proud of what they have to offer and rise to the occasion. They are not afraid to show off their “true colours” that catch the imagination of the onlooker. My work is dedicated to kids of all ages - where reality isn’t an issue – where there is room for a little or a lot of non-sense-ical fun to enjoy. Nonsense is better than no sense at all! Imagine-action is the magical formula to stimulate the mind of the dreamer – day or night. So when life’s a drag “Be a Dragon”, always keep your true colours, fire in your belly, and your eyes on the sky! Don’t be afraid to dream or fly!